Every semester, our Women’s Studies 100 – Intro to Women’s Studies course features a new theme and is taught by our SBAI Teaching Fellow. This Fall 2011 semester, SBAI Teaching Fellow Rebecca Burditt will be teaching WST 100, titled Spectacular! Spectacular! Gender and Sexuality in the Hollywood Musical. Course description: As a genre that routinely embraces flights from reality in the form of song and dance, the Hollywood musical occupies a unique place in American film. 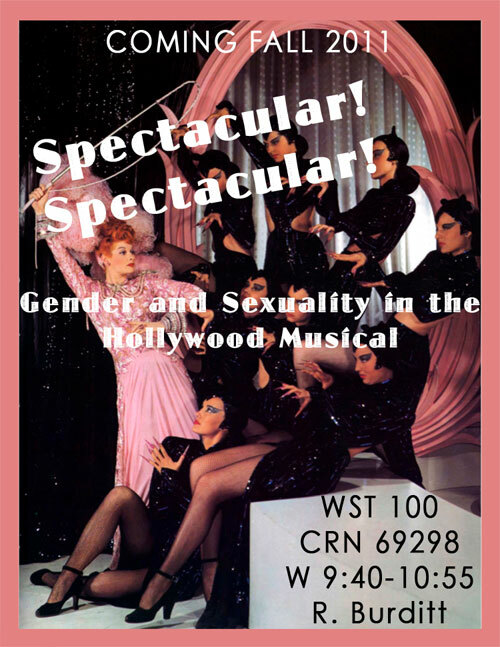 This course will examine the historical development of the Hollywood musical and its engagement with contemporary issues of gender and sexuality. How does its “spectacular” form and structure play with conventional modes of representing men, women, and romantic love on screen? In what ways does the performativity of the bodies in musical numbers open up new forms of audience identification? Together, we will examine musical films – their visual and narrative formulas, their resonance with various spectator groups – with respect to foundational concepts in Women’s and Gender Studies. We will then devote time to analyzing the appearance of these classical conventions in music videos, commercials, and recent television shows, paying special attention to what such appropriation might indicate about the politics of popular media representation today. Registration begins this coming Monday, April 4th, for Fall 2011. This entry was posted in Announcements and tagged #courses. Bookmark the permalink.